R.V College is well known for the harmonious blend which it brings out between the academics and cultural activities. 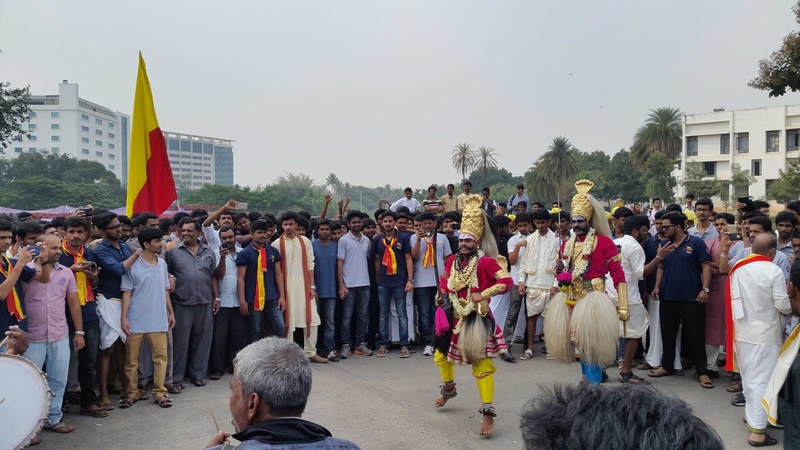 “KAHALE” is one of the cultural fests organised by Kannada Sangha, Rotaract Club of RVCE and NCC-RVCE. NCC-RVCE has played an important role of welcoming the guests for the program with honour. A piloting team led by JUO Sukshith Shetty took charge of this responsibility. 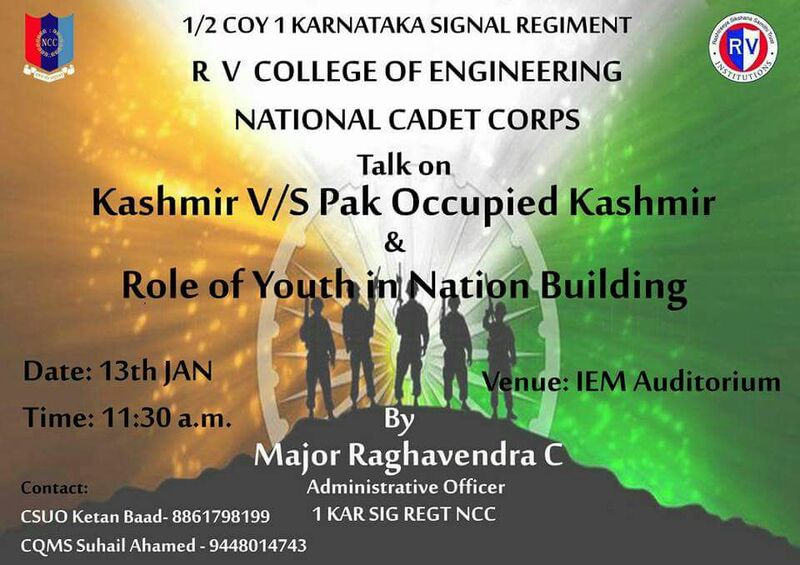 On 13th January 2017 Maj Raghavendra C from Garhwal regiment of the Indian Army gave a talk on Pakistan Occupied Kashmir (POK) and role of youth in nation building. The students were given a clear picture about thr geographical map of Kashmir. In addition to it he clarified various doubts regarding controversial topics about the Indian Army. He created awareness about role of youth in nation building and reminded them about their responsibilities. The day was indeed memorable and the students took away home something special. The Blood donation Camp was organised at R.V College of Engineering in collaboration with Rotaract club of RVCE and NSS-RVCE. More than thousand units of blood was collected. Seven blood banks of the city participated in the drive. NCC-RVCE looked after the overall management of the drive by assisting the registration, guiding the donors and providing refreshments. A day before the drive an awareness walk was held around the campus. Srishti is a state level engineering student’s project exhibition and was hosted by R.V College of Engineering.The cadets of NCC-RVCE volunteered for the three day event which was inaugurated on May 26th 2017. The event was inaugurated by honourable Governor of Karnataka Shri Vajubhai Vala. The guard of honour team led by SUO Ketan Baad gave the National Salute to the Governor. On 15th August 2017 the country’s 71st Independence Day was celebrated at R.V College of Engineering with pomp and show. The celebrations began with the arrival of the chief guest Maj Bhavana M V. Followed by the flag hoisting and National Anthem. A well scripted play highlighting the Independence Day celebrations at various institutions was performed under the oration of CDT Rahul Prakash. The play was followed by group song and address by the chief guest and RVCE alumni. To add to the already memorable 71st Independence Day, A plantation drive was conducted inside the college campus to stress upon the increased need of afforestation. The drive was inaugurated by chief guest Maj Bhavana M V by planting the first sapling. Then the saplings were planted by our beloved principal Dr. K N Subramanya, Dean Infrastructure Dr. B.L. Shivakumar, ANO Lt.(Dr.) Mahendra Kumar , HOD’s of various departments.NCC-RVCE also took a pledge to look after the planted saplings. The Graduation Day ceremony of the 7th batch of Bachelor of Engineering was held on 29th of July 2017. Dr. Yaj Medury, Vice Chancellor of Bennet University, Greater Noida arrived as the chief guest.The team for the ceremony consisted of a band team of thirteen cadets led by JUO Deekshith and a piloting team of six cadets commanded by SUO Suprabha. 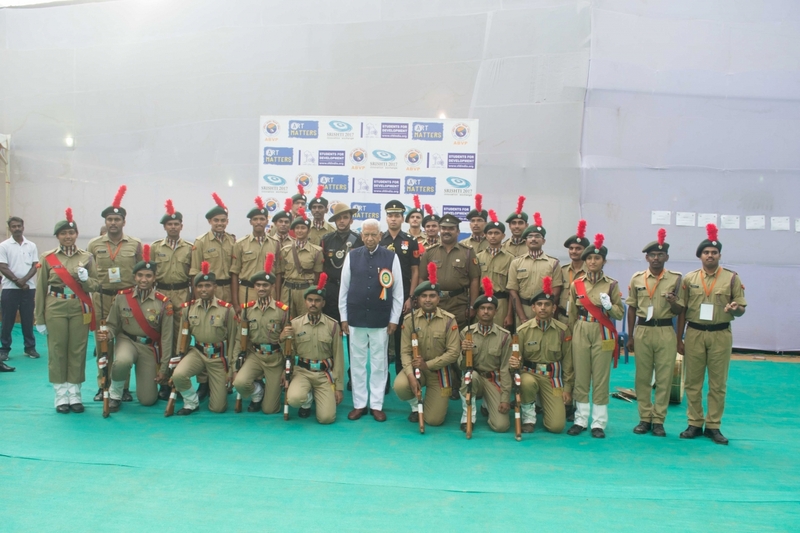 The teams were dressed glamorously in the NCC ceremonials.The chief guest for the ceremony Dr. Yaj Medury was welcomed by the cadets of NCC-RVCE. The cadets of NCC-RVCE gave a grand opening to the Sports day 2017 at RVCE by leading the marching contingents of various departments. Every contingent was led by two cadets of NCC-RVCE. A separate band team dressed in ceremonials was set up to add splendour to the event. Cadets of NCC-RVCE also won many competitions during the day thanks to the rigorously conducted parades during thier tenure. NCC-RVCE had taken up the responsibility of hosting C-Certification Examination for Bangalore-A group. 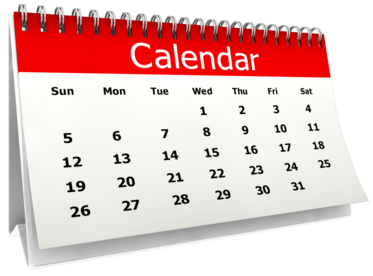 The exam was held on 26th February 2017. 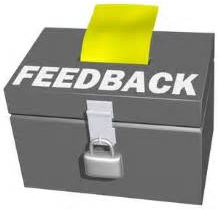 Being the best institution of the directorate the expectations were very high. NCC-RVCE lived upto the expectations by conducting the examination in a systematic manner. Many officers and cadets personally thanked the NCC-RVCE cadets for the hospitality and also appreciated our organizational skills. The State Republic Day-2017 was held at the Manekshaw parade Grounds, Bengaluru. 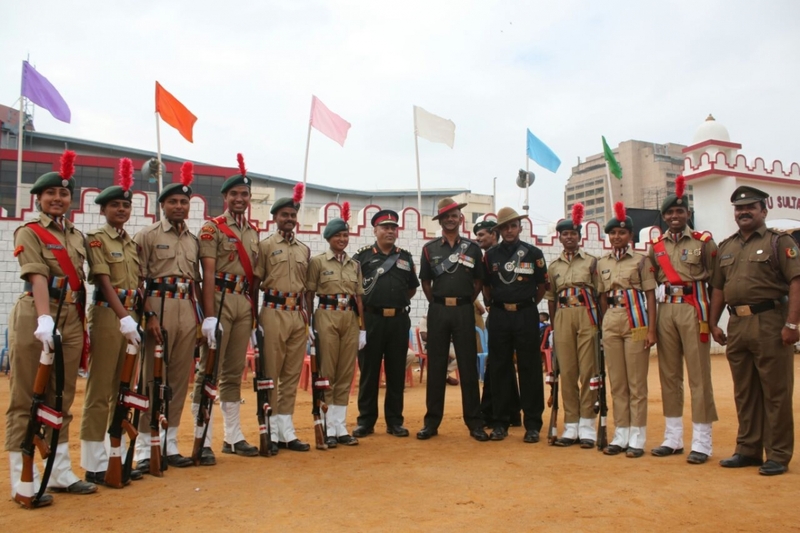 Prior to that A State Republic Day Camp was held to select the marching contingent. Various basic skills like rifle drill, “Rifle kholna and jodna” were taught to the cadets. Nine cadets from NCC-RVCE participated in the parade and JUO Sukshith was the camp commander. Under the direction of Ministry of Human Resource Development, Government of INDIA, NCC-RVCE conducted a cleanliness drive on September 28th 2017 in the outskirts of the campus and created awareness through placards. Today NCC-RVCE has rose to fame because of the dedication and constant hardwork of its cadets. So when every year when a batch passes out it becomes the responsibility of the immediate seniors to bring in a batch of fresh and talented faces into the family. 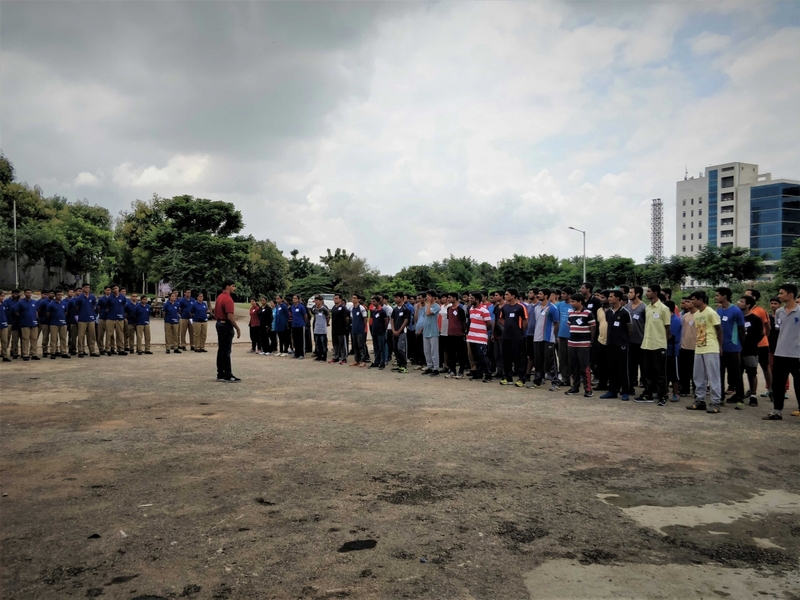 The recruitment of the 2017-2020 batch of cadets was conducted on 9th of September 2017.The recruitment began with a relatively easier written test followed by a running round and few push-ups. The potential recruits were later interviewed by Col Bhupesh Kumar, Commanding Officer of 1 KAR SIGNAL REGIMENT and Maj Raghavendra C , Administrative Officer of 1 KAR SIGNAL REGIMENT. At the end of the day the cadets were briefed about the working of NCC-RVCE and the roles and responsibilities which each cadet may face during his/her tenure. 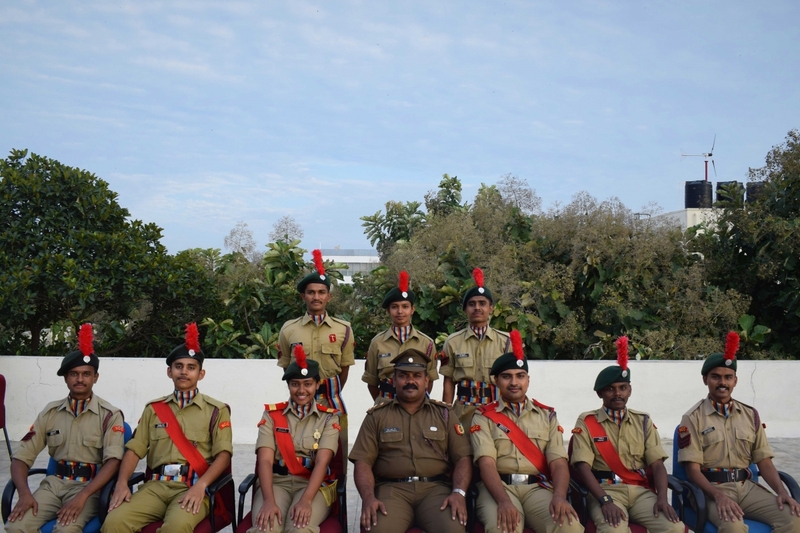 The seniors of the NCC-RVCE fraternity are shouldered upon the responsibility of looking after the overall functioning of this esteemed organization. This comes with the distribution of ranks by the superiors. This day indeed is a proud moment for a cadet in his entire NCC career where his contributions are recognized and he/she is awarded the ranks for it. The rank distribution ceremony for the 2017 batch was conducted on September 9th 2017. The ranks were awarded by our beloved principal Dr. K.N Subramanya, Col Bhupesh Kumar and Maj Raghavendra C.